PVC beadboard is an excellent alternative to wood beadboard, particularly when used in applications such as outdoor rooms, patios, decks or bathrooms. Unlike wood, PVC is more stable in these settings and less susceptible to damage from the weather or damp. This material is simple to install with the same tools that you would in standard woodworking. It can also be painted to add color to your space. PVC Beadboard is extremely low maintenance. It can be easily washed with a simple household cleaner and a rag. This material is also very durable, so much that some companies have as much as a 25 year warranty on their product. It is also a cost effective solution, as it is less expensive and needs less preparation than traditional wood beadboard. The first step toward installing PVC beadboard is to fasten it to the wall or ceiling. It can either be hand nailed or power nailed, just the same as wood. Your nails should be at least 1 1/2-inches long so that each one penetrates to a minimum of one inch. As well, it should be nailed at a maximum of every 12 inches with fasteners fixed at least two inches or less from the end of each board. Because PVC is a thermoplastic material it will expand and contract a little bit. This movement will require you to follow some general rules to ensure that it doesn't buckle or bind. Leave a minimum of 1/4-inch to 1/2-inch gap between the edge of the beadboard and any solid substrate. You can use trim or moulding to cover the gap. For a run of beadboard that exceeds 18 feet, you will want to use a technique called face nailing. This allows you to reduce the space between the nails across the width of the beadboard, which helps restrict expansion and contraction. When it is possible, place the beadboard in the direction that uses the shortest amount of board length possible. There is less expansion and contraction if the length of the board is shorter. One of the most attractive aspects of PVC is that it doesn't need to be painted for protection. It is best to use 100 percent acrylic latex or 100 percent acrylic latex with a urethane additive, which will ensure durability and flexibility. You should never use a dark paint over PVC because darker acrylic colors absorb heat and increase the expansion and contraction capacity of the PVC.Because of this it is best to use only light to medium colored paint with a light reflective value. If you think that PVC beadboard is the right material for your home, there are a couple of companies to look for that produce some of the best in the business. AZEK Building Products has been manufacturing PVC materials since the mid 1980s. In 1999 the company introduced trimboards as a replacement for wood, including high-performance beadboard. Their beadboard is available in two styles. Both have a reversible edge/center bead and v-groove, which offers flexibility for how you want to use it in your project. 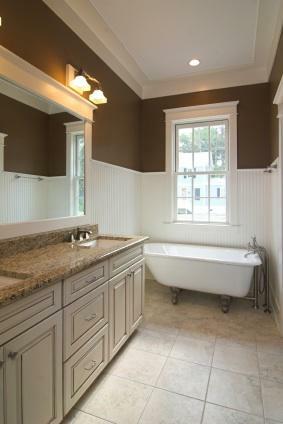 AIC Millworks produces a popular PVC PolyMax Beadboard Wainscoting. Their selection includes waterproof recycled PVC beadboard that can be used in both interior and exterior applications.AIC Millworks manufactures, distributes and sells premier building products. They are not a traditional retail outlet, but they do provide product samples so you can see and feel the material before you purchase it for your project.